Keep you and your team safe with The Magnetic Manhole Buddy cover Lifter. 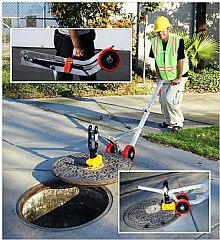 No more back injuries, no pulled muscles – the magnetic manhole lifter makes it simple and easy to lift virtually any manhole cover without the need for keys or other tools. The Magnetic Manhole Buddy cover lifter delivers a high mechanical advantage to enable the operator to free and remove just about any size of cover or lid up to 100kg. The 360 degree lifting hanger can be rotated and placed in any position so covers can be lifted from a convenient position without having to worry about parked cars, curbs or moving traffic. Typically manhole covers will be stuck in the frame, to overcome this problem the the magnetic manhole lifter has a unique high leverage position that can usually break free stuck covers.